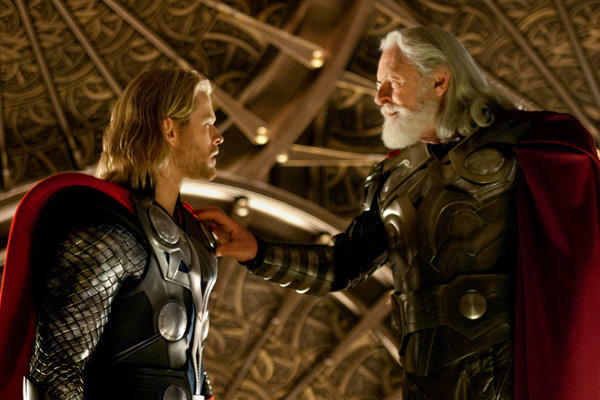 Even though Thor lacks an epic story and romance, its themes of family and epic visuals make it a triumph. I spent a long time trying to come up with a title that didn't use the word "hammer" since everyone's doing it, but it really does feel like being hit with a hammer of action for two hours. 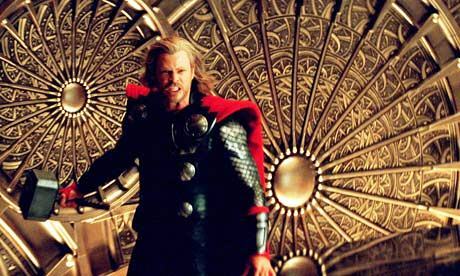 Thor is about the egotistical son (Chris Hemsworth) of the ruler of the mythical world of Asgard. They have incredibly advanced technology and during the Nordic age fought of the evil frost giants. While on earth, he literally runs into an astrophysicist named Jane Foster (Natalie Portman). She and her friends, Erik Selvig (Stellan Skarsgård) and Darcy Lewis (Kat Dennings), try to protect him from a government agency trying to identify a mysterious unmovable hammer that has crashed to the New Mexico desert. Meanwhile, his brother Loki (Tom Hiddleston) is scheming to take over as ruler of Asgard. Visually, the film is like nothing you've ever seen. The world of Asgard is made up of enormous constructs made of gold. The Asgardians, especially Thor's best friends Volstagg (Ray Stevenson), Hogun (Tadanobu Asano), Fandral (Josh Dallas) and Sif (Jaimie Alexander), are all larger than life. You would think a movie about mythical Norse gods landing on Earth would be unrealistic, but director Kenneth Branagh manages to keep the acting solid and never goes over the top. The acting is solid and powerful. Especially the flawless performance of Anthony Hopkins as the powerful king Odin All-Father. Fatherhood and family are core themes in the movie, and his performance helps anchor the other performances. Chris Hemsworth manages to carry his imposing form with the dignity and manner of a man used to ruling an entire world. Loki is given an almost tragic background making him less evil than misguided. He's still deliciously evil though. Rene Russo, Thor's mother Frigga, plays the wife of the king with power and grace. My favorite scene with her is when she picks up a sword and prepares to defend herself. She fails, but shows she's not just a helpless damsel. Being a comic book movie there are the usual fight scenes some of which feel a little contrived. Others, like the Frost Giants, are epic. The love story was almost non-existent. The chemistry between Hemsworth and Portman was there, but it didn't feel like love. It was more like best friends that kiss. Overall, if you're looking for a fun movie that delivers a punch of action, but not much else, you'll enjoy Thor. If you've never heard of Thor check out my overview post on him. What do you think of Thor? Will you go see it this weekend? You're right. It did feel more like a prelude to the real story. Avengers will rock. I thought it was clever how they worked in his secret identity without making him a cripple. Amazing comic to own btw. Lightning Strikes with Epic 'Thor' Movie. I love that title! And though the movie was not like Thor in the comic book (Journey into Mystery #83 ...which I have by the way), it was definitely an epic movie. Yet, Thor movie to me seemed to be more like an introduction to Asgard and the God of Thunder. So who knows, it might just be that Thor II, will bring Thor back just as he was in the comics. (as Donald Blake) who, we never saw in the movie. Though he was mentioned as, Jane Foster's "Ex-hubby". Hmmm? Does that mean Love and Kisses on the way? That is the coolest story! As a father of a budding geek (he's only 2) its my hope he'll grow up reading these comics too. My favorite part of any of these comic movies, especially this one which was pretty cool, is that my completely non-geek daughter likes them and I can go "Really?!!!! You know it was a comic, right?!!" and then pull out the boxes ....and she'll actually sit and read them. I hope they pump out loads more just for that. Which Spaceship Should Our Dream Team Fly In?